In August 1997, Harris Publications released the first issue of XXL. It featured rappers Jay-Z and Master P on a double cover. In December 2006, XXL took over the struggling hip hop producer and DJ magazine Scratch (another publication owned by Harris Publications), re-branding it as XXL Presents Scratch Magazine. However Scratch shut down less than a year later in September 2007. Other titles with limited runs have been launched under the XXL brand, including Hip-Hop Soul, Eye Candy and Shade45. XXL has released many other special projects including tour programs, mixtapes and exclusive DVDs. XXL also maintains a popular website, which provides daily hip hop news, original content and content from the magazine. In 2014, Townsquare Media acquired XXL, King and Antenna from Harris Publications. On October 14, 2014, Townsquare announced it would continue print publication of XXL. In December 2014 the company reported that the magazine would be published on a monthly basis. The magazine's past editors include Reginald C. Dennis (formerly of The Source), Sheena Lester (former editor-in-chief of RapPages and Vibe music editor), Elliott Wilson (formerly of The Beat Down Newspaper, ego trip and The Source, currently locked in at #7 slot on The Source's Digital 30 list.) and Datwon Thomas (former editor-in-chief of King). In May 2009, Datwon Thomas resigned from XXL and executive editor Vanessa Satten, who had been with XXL since 1998, was named the new Editor-in-Chief. 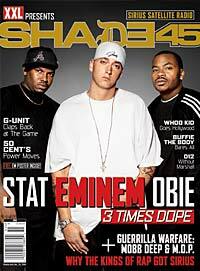 In August 2005, Eminem and XXL teamed up to release a special issue titled XXL Presents Shade 45, and was designed to give maximum exposure to Shade 45 as a radio station, and at the same time give maximum exposure to the Shady Records label as a whole, as well as the radio DJ's and G-Unit Records' artists. XXL executive Publisher, Jonathan Rheingold, stated that typically magazines based around particular artists were not favorable, but "since Shade 45 is a truly authentic and uncensored rap radio channel, the marriage with the XXL brand made sense," with the feeling that it is what would interest rap fans. In November 2008 XXL released XXL Raps Volume 1, which included music from 50 Cent, G-Unit, Common, Jim Jones, & Fabolous. In September 2006, XXL put a special 90 minute DVD called XXL DVD Magazine Vol. 1, which featured exclusive interviews and content with big-name rappers such as 50 Cent, Ice Cube, Fat Joe, Paul Wall, & Mike Jones. On August 20, 2013 XXL released its 150th issue, also celebrating its sixteenth anniversary. The issue featured the first solo cover on the magazine from Drake, and rappers such as Kendrick Lamar and B.o.B reviewing classic albums. Beginning in 2007 (skipping 2008), XXL releases its annual "Freshman Class" list. The issue features ten artists-to-watch, all appearing on the cover of the magazine. The list has a history of showcasing unknown/underground rappers, as well as artists considered to be on the rise. The list creates significant buzz among listeners and artists alike, and is credited for giving many artists their first taste of fame. In 2013, XXL added an honorary 11th spot for Chicago rapper Chief Keef due to the artist being in a six-day jail stint and therefore being unable to attended the photo shoot in New York City. The following year in 2014, the Freshman Class list included two extra spots, bringing the amount of rappers included in that year's list up to 12. This was a one-time occurrence, however, as the list reverted to its regular ten spots in the following years. In 2018, the list was reduced to nine artists following a refusal to appear from Pennsylvania rapper Lil Skies, who accused that year's list of being rigged. Skies' replacement, New York rapper Rich The Kid, declined the list also. The 2018 list drew a lot of criticism due to artists being missing such as NBA Youngboy & 6ix9ine. 2007 Saigon, Plies, Rich Boy, Gorilla Zoe, Joell Ortiz, Lupe Fiasco, Lil Boosie, Crooked I, Papoose and Young Dro. 2009 Wale, B.o.B, Charles Hamilton, Asher Roth, Cory Gunz, Blu, Mickey Factz, Ace Hood, Currensy and Kid Cudi. 2010 J. Cole, Pill, Nipsey Hussle, Freddie Gibbs, Big Sean, Wiz Khalifa, OJ da Juiceman, Jay Rock, Fashawn and Donnis. 2011 Meek Mill, Big K.R.I.T., Cyhi the Prynce, Lil Twist, Yelawolf, Fred the Godson, Mac Miller, YG, Lil B, Kendrick Lamar and Diggy Simmons. 2012 Future, Kid Ink, Danny Brown, French Montana, Macklemore, Don Trip, Machine Gun Kelly, Hopsin, Iggy Azalea and Roscoe Dash. 2013 ScHoolboy Q, Trinidad James, Joey Bada$$, Ab-Soul, Logic, Action Bronson, Kirko Bangz, Travis Scott, Dizzy Wright, Angel Haze and Chief Keef. 2014 Chance The Rapper, Rich Homie Quan, Isaiah Rashad, Ty Dolla Sign, Lil Durk, Kevin Gates, Troy Ave, Vic Mensa, Jon Connor, Lil Bibby, Jarren Benton and August Alsina. 2015 Fetty Wap, Dej Loaf, Raury, Kidd Kidd, OG Maco, Shy Glizzy, K Camp, Vince Staples, Tink and GoldLink. 2016 Lil Uzi Vert, Lil Yachty, Kodak Black, Denzel Curry, G Herbo, Dave East, Lil Dicky, Anderson Paak, Desiigner and 21 Savage. 2017 Kamaiyah, A Boogie Wit Da Hoodie, PnB Rock, Playboi Carti, Aminé, Kap G, Kyle, Ugly God, MadeinTYO and XXXTentacion. 2018 Ski Mask the Slump God, Lil Pump, Smokepurpp, J.I.D, Stefflon Don, BlocBoy JB, YBN Nahmir, Wifisfuneral and Trippie Redd. Some artists have turned down the list, such as Drake, Nicki Minaj, Tyler, The Creator, A$AP Rocky, Earl Sweatshirt, Young Thug, PARTYNEXTDOOR, iLoveMakonnen, Tory Lanez, Bryson Tiller, Post Malone, Rich the Kid, and Lil Skies. ^ a b "Drake On The Cover Of XXL's 150th Issue". XXL mag. August 2013. Retrieved January 4, 2014. ^ "Hip-Hop News, Rap Music". XXL. Retrieved October 14, 2014. ^ a b Marc Schneider (December 18, 2014). "XXL Magazine to Print Quarterly Issues". Billboard. Retrieved August 17, 2015. ^ Rob Markman (October 14, 2014). "Exclusive: XXL Magazine Isn't Going Out Of Print". MTV News. Retrieved October 14, 2014. ^ Jacobs, Allen (2008). "XXL Editor-in-Chief Elliott Wilson Fired". www.hiphopdx.com. Retrieved January 8, 2007. ^ Wolfe, Roman: "XXL Magazine Fires EIC Elliott Wilson", AllHipHop, 2008. "Archived copy". Archived from the original on January 9, 2008. Retrieved January 8, 2008. CS1 maint: Archived copy as title (link) Retrieved January 8, 2007. ^ Langhorne, Cyrus (May 27, 2009). "Former XXL Editor-In-Chief Looks Beyond Publication, "It Was A Hard Decision"". Sohh.Com. Retrieved January 4, 2014. ^ Carl Chery (August 23, 2005). Eminem & Shade Collabo W/XXL For Special Radio Issue Archived June 9, 2008, at the Wayback Machine. SoHH.com. Accessed January 29, 2008. ^ "XXL Raps, Vol. 1: Music". Amazon.com. Retrieved 2014-01-04. ^ "Saigon & Ice Cube I'm Talkin' To You - XXL". Xxlmag.com. September 11, 2006. Retrieved January 4, 2014. ^ Schwab, Isabel (June 4, 2015). "The 'XXL' Freshman Class List Is a Joke: Kidd Kidd, Iggy Azalea, and More Rap Lunacy". The Daily Beast. Retrieved June 19, 2016. ^ "Grading XXL's Top 10 Freshman List". Refinedhype. Retrieved January 4, 2014. ^ "2010 XXL Freshmen class". XXL. July 14, 2011. ^ "2011 XXL Freshmen class". XXL. July 14, 2011. ^ a b "2013 XXL Freshman Issue Explained: Why Logic? Where's Chief Keef?". MTV News. Retrieved 2018-06-15. ^ "XXL Announces 2018 Freshman Class, With Lil Pump, Smokepurpp, Trippie Redd & More". Billboard. Retrieved 2018-06-15. ^ "Lil Skies Says He Declined XXL Freshmen List Because It's Rigged". HotNewHipHop. Retrieved 2018-06-15. ^ "Rich The Kid Says He "Happily Declined" The 2018 XXL Freshmen List". HotNewHipHop. Retrieved 2018-06-15. ^ "Where Are They Now? : 2007 Freshman Recap - XXL". XXL. March 27, 2012. Retrieved January 4, 2014. ^ "Where Are They Now? : 2009 Freshman Recap - XXL". XXL. March 24, 2011. Retrieved January 4, 2014. 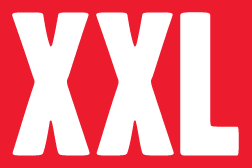 ^ "XXcLusive: XXL's 10 Freshmen for '10 Cover Revealed - XXL". XXL. March 1, 2010. Archived from the original on February 9, 2013. Retrieved January 4, 2014. ^ "XXL Presents 2011's Freshman Class - XXL". XXL. February 22, 2011. Retrieved January 4, 2014. ^ JP DelaCuesta (February 28, 2012). "XXL Reveals Cover For Its 2012 "Freshmen Class"". AllHipHop.com. Retrieved January 4, 2014. ^ "XXL Freshman Class 2013 Cover Revealed - Page 2 of 2 - XXL". XXL. March 27, 2013. Retrieved January 4, 2014. ^ "XXL Freshman 2014 Cover and 10 Spot Revealed". XXL. May 5, 2014. Retrieved May 5, 2014. ^ "The Wait Is Over: Here Is the 2015 XXL Freshman Class". XXL. June 3, 2015. Retrieved July 20, 2018. ^ "It's Here: The 2016 XXL Freshman Class". XXL. June 13, 2016. Retrieved July 20, 2018. ^ "XXL Freshman 2017 Cover Revealed". XXL. June 13, 2017. Retrieved June 13, 2017. ^ "XXL Freshman 2018 Cover Revealed". XXL. June 12, 2018. Retrieved June 12, 2018.